A healthier version of the traditional cinnamon roll, the Banana Cinnamon Roll Smoothie is a decadent and super creamy smoothie you can enjoy every day without any of the guilt. It even has added oats, which means you can have dessert for breakfast! I received this product for free from Moms Meet (momsmeet.com) to use and post my honest opinions. Compensation for this post was provided and this page may contain affiliate links. This post includes affiliate links, and I will earn a commission if you purchase through these links. Please note that I’ve linked to these products purely because I recommend them and they are from companies I trust. We had a pie shop open up down the road and they offer pie milkshakes. Let that sink in for a minute….they put an entire slice of your favorite pie into a blender and make it into your very own personal milkshake….Ahhhh yu-huh, hand raised, front of the queue. Are We Adding A Cinnamon Roll To A Smoothie (Please Say Yes)?!? I heard about this place around the same time all things cinnamon roll started showing up in stores with the onset of Fall. Whilst I am not very well going to put an entire cinnamon roll into a blender and make it into a smoothie for you (I know I know, I’m sorry, yes it would be amazing….). I have made a much healthier version you can enjoy EVERY day without having to worry about the sugar, calories, and dangerousness of it all. Save the real pie-shake for the weekend. Now I don’t know what happens in your house, but in mine when I make a smoothie I have 3 little vultures circling around me cawing for their share. I always have to make separate batches because I like to put things in mine they can’t have: coffee, collagen, spirulina, matcha, protein powder. You get the picture. So when I finally got my hand on some of those Vitamix personal cup adapters Costco has been teasing me with for so long, I was beyond excited. We have been separate smoothying it up all day. I make my own batch in my cup, snap on the lid and I am good to go with getting everyone out the door in the morning. The kids get their own whole jug. Success. Look at how creamy that is! What’s The Deal With The Vitamix Personal Cup? It’s easy, you just put your ingredients in the cup in the recommended order, screw the adapter onto the top, and flip it over to attach to your Vitamix base. When you’re done blending, remove from the Vitamix base, unscrew the adapter, and put the lid straight onto the personal cup. Voila, you are good to go! This easy-clean, spill-proof personal cup works very well and is great for both on the go and portion control (since in the bigger blender, it’s hard to see how much you’re really making when you are creating smoothies on the fly). As long as you layer in your ingredients in the recommended order, they blend perfectly. One of my favorite features of the personal cup is that it is double insulated so that your liquids stay cold for a long period of time (because we all know drinking a smoothie without being interrupted is a pipe dream and that baby will be following us all morning through the school run, grocery run and putting the actual baby down for a nap). Another huge benefit is that the cup is made of BPA free materials. Winning. Another add-on we use regularly with our Vitamix E310 Explorian Series Blender is the under blade scraper. During the school year, we make nut butter regularly for use in sandwiches, as a dip for fruits (apple slices and almond butter = yum), or as an add-in for smoothies. The Vitamix can make homemade nut butter in just a few minutes. Simply add nuts into the blender and pulse until the oils are released and nut butter is smooth and creamy or at your desired texture. I also make a mean coconut butter with mine: check it out here. Where Can I Get my Own Personal Cup Adapter to Make this Banana Cinnamon Roll Smoothie? They can be found at Amazon, Target, Sur La Table or Williams Sonoma. Or just pop over to their website vitamix.com/us/en_us/Where-To-Buy for the full list of accessories. Now For the Banana Cinnamon Roll Smoothie! 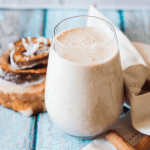 A healthier version of the traditional cinnamon roll, the Banana Cinnamon Roll Smoothie is a decadent and super creamy smoothie you can enjoy every day without any of the guilt. It even has oats in there, which means you can have dessert for breakfast! Add everything to the blender in the order listed and blend until smooth. Optional add-ins: coffee, protein powder. It is ok to use chia seeds if you are going to serve this and drink it straight away. If you plan to keep it or sip on it over a period of time it may become gelatinous, which I don't mind but some people (my husband) won't drink. I am a huge fan of smoothies that taste like desserts! This is a combo I haven’t tried before but I absolutely will now. Sounds amazing. I have all the ingredients for this. I know what I will be making for breakfast tomorrow. This smoothie sounds incredible! A cinnamon roll smoothie is such an awesome idea! Love that it’s a healthy option. Love the flavors in the smoothie. Can’ t wait to try this recipe. Yummy. This banana smoothie combination looks WICKED GOOD!! I love all of the ingredients. I am trying to eat clean this week so I am going to make this as a special treat for myself!! YUM! Now, I am not a fan of smoothies — I like to chew my food and drink my wine. But this is a different story completely!! I can just imagine the rich taste of the cinnamon plus banana. I’d love to have this after my workout. I’m going to make this smoothie this week. WOW WOW WOW, the title alone got me drooling but going through the list of ingredients, I love this recipe even more! love that you incorporates some chia seeds and also dates for natural sweetness! A great healthy breakfast for sure! You have officially come up with the tastiest, most delicious sounding smoothie ever! Cannot wait to make this!!! Love the color you have on this drink. And I love the name.. Banana cinnamon smoothie – my absolute favorite. I must make this for my kids soon. They will definitely enjoy this very much. Oh, my word. A banana cinnamon roll smoothie? I’m in! This does look so creamy and delicious. I love all the ingredients and will be adding the chia seeds when I make it! Yay 🙂 It’s so creamy!! I love the chia, but my husband doesn’t drink his for hours after I make it so it does get a bit gelatinous in his case.